We had the privilege to meet cute, little Ringo the rhino in February 2016 in the Ol Pejeta Conservancy in Kenya. We will remember him and all the joy he brought to us for the rest of our lives. Ringo was an abandoned southern white rhino calf that was saved in 2015. During his short life, he inspired numerous people all over the world with his playful antics and utterly irresistible charm. 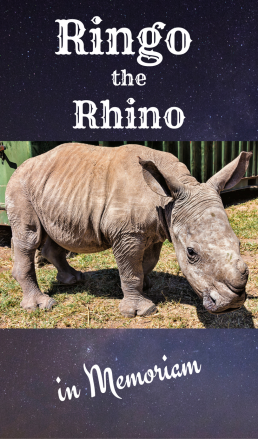 It is notoriously difficult to raise wild-born rhinos in captivity, and little Ringo too fell ill in 2016. After two weeks of sickness, Ringo sadly passed away on the 19th of July in 2016, his loyal and devoted caregivers on his side. I remember when the sad news reached us. We were in Medellín, Colombia, at breakfast in our hotel and I happened to read the news on my phone. Maybe because we had met Ringo in person, and he had made such a powerful impact on us, I felt especially sad, and a tear escaped from the corner of my eye. But because we certainly weren’t the only ones who had been touched by the joyous spirit of this little southern white rhino, we want to ask everybody to celebrate his life instead of being just sad that he is no longer with us. We would like people to remember him as he was – a happy and playful, little rhino, who by simply being himself, undoubtedly helped to raise awareness about the plight of all rhinos in Africa. So, to honor Ringo’s legacy on this World Rhino Day today we wanted to make this special video and remind all of you to help save the rhinos of this earth! We still have time, but we have to act now. 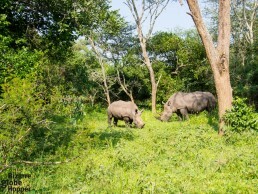 Let every day be a rhino day! We want to say special thanks to Ol Pejeta Conservancy and Ombeni African Safaris for this extraordinary experience. 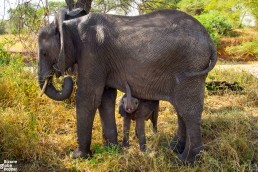 Give a gift of life - adopt an elephant! 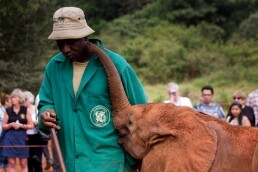 The orphan-elephant program developed by The David Sheldrick Wildlife Trust is the most successful in the world. We visited their orphanage in Nairobi and decided to foster a baby elephant. 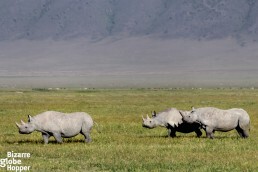 On a safari adventure looking for the famous Big 5 in the Northern Circuit of Tanzania. It’s an amazing and surprising Game.